In politics, location is as important as it is in real estate. 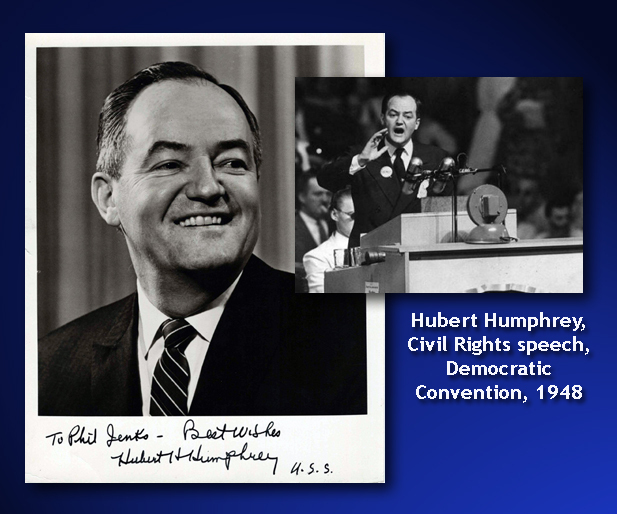 Hubert Humphrey was one of the great political and moral leaders of his generation. Unfortunately, he was located too closely to politicians who had more charisma and more power than he, but less vision. No candidate for president in 1960 has a better record on civil and human rights than Hubert Humphrey, but he couldn’t match the magnetism or pocketbook of John F. Kennedy. In 1968, his presidential campaign was overshadowed by his closeness to Lyndon Johnson and Vietnam. Richard Nixon eked out a narrow victory that year, though skeptics believe that was because Nixon deviously convinced North Vietnam to ignore LBJ’s peace overtures until after the election. I do not believe that there can be any compromise of the guarantees of civil rights which I have mentioned. In spite of my desire for unanimous agreement on the platform there are some matters which I think must be stated without qualification. There can be no hedging – no watering down. There are those who say to you – we are rushing this issue of civil rights. I say we are 172 years late. The speech helped precipitate the walk-out of southern delegates, who formed the Dixiecrat Party and rallied behind Strom Thurman’s presidential candidacy. The party split seemed to doom President Truman’s chances for re-election. Humphrey’s speech may have annoyed Truman, who did win the 1948 election, but it propelled him into the U.S. Senate. His progressive record commanded national attention and in 1960 he ran unsuccessfully for president in primaries that were dominated by John Kennedy. 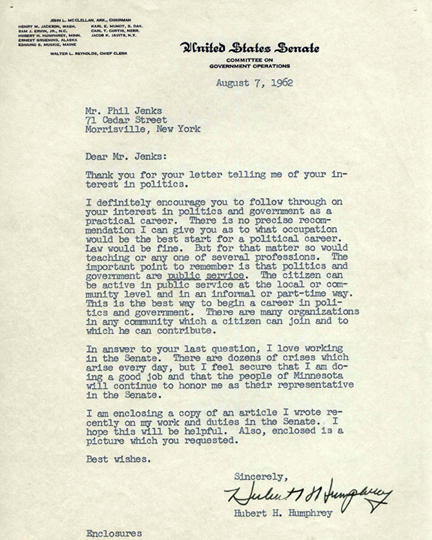 Humphrey continued in the Senate during the Kennedy years and I wrote to him on several occasions, usually eliciting a thoughtful response from him. In 1964, Humphrey spearheaded support for Lyndon Johnson’s Great Society legislation, including the Civil Rights Act of 1964. Both Humphrey and the president realized the bill would not be supported by southern Democrats. LBJ recruited Republican leader Everett Dirksen to bring moderate Republicans into the fold, and Humphrey played a pivotal role in bringing the bill to the president’s desk for signing. LBJ rewarded Humphrey by naming him vice president inn the 1964 election. For the most part, Humphrey was treated badly by Johnson — who, as a former vice president himself, should have known better. But Humphrey was a loyal supporter of the president and his Great Society. Humphrey was re-elected to the senate after his difficult turn as vice president and he continued to serve with distinction. After the election of 1976, when Jimmy Carter defeated Gerald Ford, Humphrey paid a friendly visit to the outgoing president. “I only wish I had had more time,” Ford told him. Looking back, I have no doubt this country would have been much better off if Hubert Humphrey had indeed been our president, if only for a day.